Learn how to season cast iron, clean cast iron, and cook 95 tantalizing recipes in your cast iron skillet. Now with full-color photography throughout, this cookbook aims to show modern cooks how this inexpensive cast iron tool is the best pan in their kitchen. Fusing new and traditional recipes and gathering farm-fresh produce and ingredients, mother-daughter team Sharon Kramis and Julie Kramis Hearne show cooks how to make delicious food in this versatile skillet. Recipes include: Dungeness Crab Cakes with Tarragon Aioli; Dutch Baby (puffed pancake with lemon and powdered sugar); Grilled Prosciutto-Wrapped Radicchio; and Warm Pear Upside Down Cake. This collection of recipes invites all cooks to get reacquainted with the original gourmet cooking tool. Good 1454907746 Item in good condition. Textbooks may not include supplemental items i.e. CDs, access codes etc. Sure, freeze-dried camp meals are nice in a pinch, but if you can spare the space and weight, why not cook a real meal with a Barebones Cast Iron Skillet? Offered in three different sizes, these cast iron skillets are durable and naturally non-stick, and they thrive directly over the hot coals of your campfire. Make everything from pancakes and cornbread to the freshly caught trout you just pulled out of the lake with these versatile pans. They also work just as well at home, especially for dishes that you want to transfer directly from the stove to the oven. 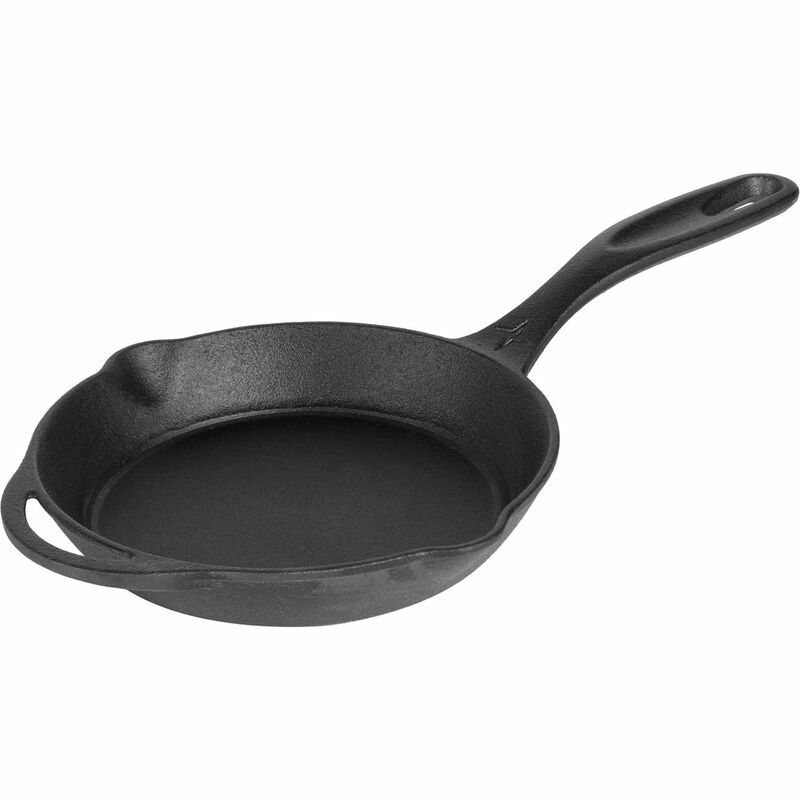 Seasoned ready to cook easy to maintain the Camp Chef 12 Seasoned Cast Iron Skillet includes grip handle for effortless lifting dual pour spouts for cooking and the Commemorative Lewis & Clark Edition cast on back. Very Good 1604336951 Minor shelf wear. The Paddling Chef Cookbook was written for people who paddle, but who no longer want to be penalized for their love of the outdoors by lifeless meals. Paddler Dian Weimer shows hungry readers how to pack, carry and cook outdoor meals that help make water borne trips memorable for all the right reasons. In The Paddling Chef Cookbook, you'll find well over 100 tried-and-true recipes for your favorite ingredients, as well as valuable planning and packing strategies. International in flavor, this cookbook contains tasty snippets from Indian, Chinese and Japanese foods, a section on wild foods, and North American recipes. Part travelogue, part cookbook, this colorful collection captures the unique charm of New England's seafood cuisine. Brooke Dojny takes you on a tour of family-owned and -operated clam shacks from Connecticut to Maine and offers dozens of simple recipes for rich and buttery lobster, fried clams, creamy chowders, and much more. Whether you're looking to plan a tasty weekend road trip up the coast or host a backyard lobster bake, you'll find everything you need in this deliciously salty collection. These 139 creative recipes for soups, salads, drinks, main dishes, and desserts show off the versatility and year-round appeal of pumpkin and other winter squash. The cast iron skillet is the ultimate cook's tool. For cooking the perfect steak or handling a fillet of wild salmon, it's sublime. For roasting vegetables it makes the seamless transition from stovetop to oven to table. Upside-down cakes and other sweet treats just turn out better in cast iron. Following up their successful Cast Iron Skillet Cookbook (2004), Sharon Kramis and Julie Kramis Hearne bring a whole world of spices, herbs, and preparations to their new cookbook that's all about big flavors. Here are spice rubs, new ingredient combinations, and a few kitchen tricks to spice up anyone's cooking repertoire. Here is possibly the best steak in the worlda seared rib-eye with truffle butter and smoked blue cheese; a wonderful tamarind glazed crab, sizzling shrimp with smoked paprika; caramelized fennel, shallot and pear tart; and a spicy raw apple cake that plays up the best of the fall harvest. The recipes from these authors are sophisticated but easy, not fussy. They work, and the results are delicious. This is home cooking at its best. 150 recipes for your cast iron skillet...including a chapter for other cast iron pans.